Jack Dewhurst believes that Clitheroe’s current standing in the table is a clear signifier of how powerful the Lancashire League is becoming. The defending champions, who only lost three times during their title-winning campaign, lost for the fifth time in 13 games at the weekend as they dropped back down to mid-table. This, however, was probably the biggest shock of them all as Bacup claimed a 58-run win to climb off the foot of the table. “It shows how competitive this league is going to be,” said the Chatburn Road captain. “We’ve played all the top sides so our position in the league can be quite misleading. It’s going to be very competitive next year. “Everything would suggest that it’s going to be the toughest league that we’ve been involved in. It’s going to be difficult every week if we get in to that top half. Home professional Ernest Kemm (54) partnered both Simon Newbitt (42) and Matthew Schofield as Bacup closed the innings on 174. Dewhurst took a hat-trick in his hugely impressive 5-24, accounting for the wickets of Dominic Boardman, Sam Lord and Liam Naylor. Professional Fawad Alam took care of the remaining five batsmen at the expense of 52 runs from 14.1 overs. Clitheroe, though, let themselves down with the bat as they were dismissed for 116. That was largely due to the display of Naylor who, having been sent packing for a ‘golden duck’ earlier, took 5-50 adding to Kemm’s 4-17. 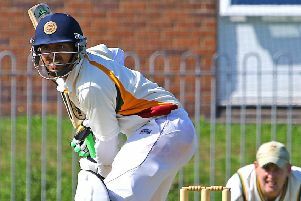 Alam hit 25 and Mulligan 20 for Clitheroe. “We just need a really good second half to the season now so we can push up the league,” said Dewhurst. Dewhurst has conceded defeat in Clitheroe’s first ever defence of their crown at this level but they still have a chance of picking up some silverware. They’ve made Twenty20 Finals Day, held at Acre Bottom on July 29th, where they’ll take on Darwen in the semi-final.